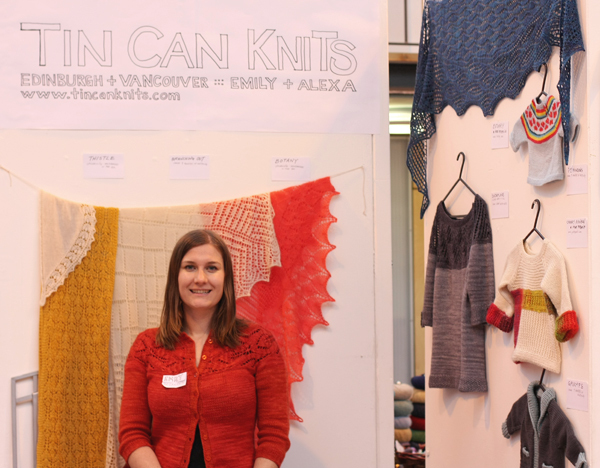 Yarn shows bring thousands of knitters into the same place at the same time, with amazing energy, excitement, and beautiful fibre products on display. 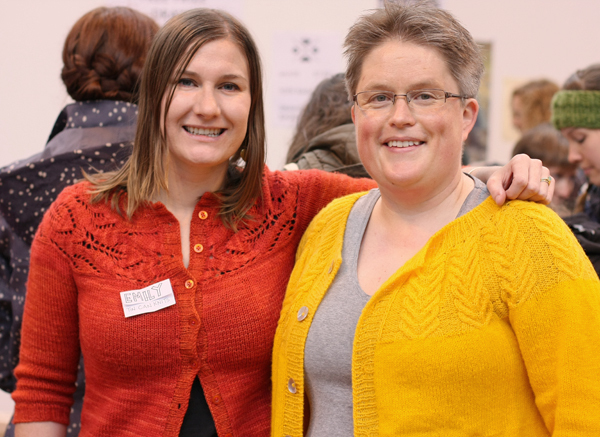 This weekend’s Edinburgh Yarn Festival was my first show as an exhibitor, and it was fabulous to chat with knitters, meet other folks in the industry, and do a bit of shopping! I signed books, talked about seamless sweater construction, made recommendations about lace (photosynthesis and sunflower work well for your first triangular shawl project), and twirled and posed to show off the new Lush cardigan! I got a signed copy of Ysolda’s sweater book Little Red in the City, (very exciting as I am a big fan of her work), and picked out some beautiful yarns from Skein Queen and The Yarn Yard. 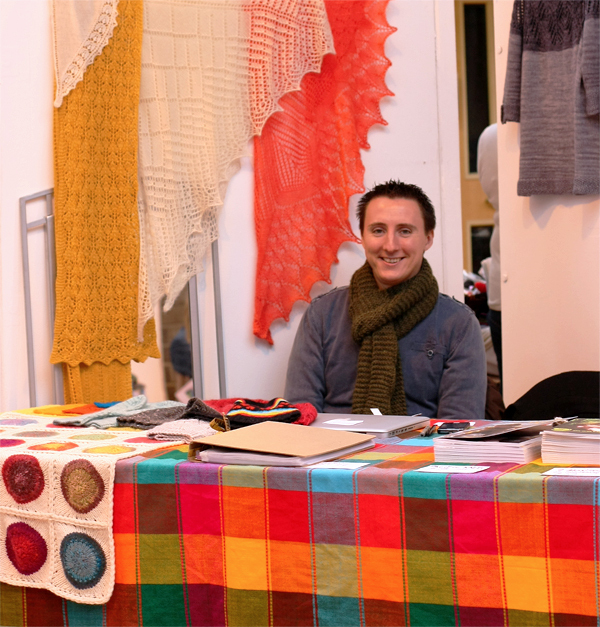 The Edinburgh Yarn Festival was the first experience that my kind and supportive husband John has had of the yarniverse (the unseen masses of knitters that come out of the woodwork for events like this). Prior to this, I don’t think he truly believed there are other people who are as obsessed as I am about yarn and knitting! Slightly out-of-his element he smiled, made change and just generally looked adorable! 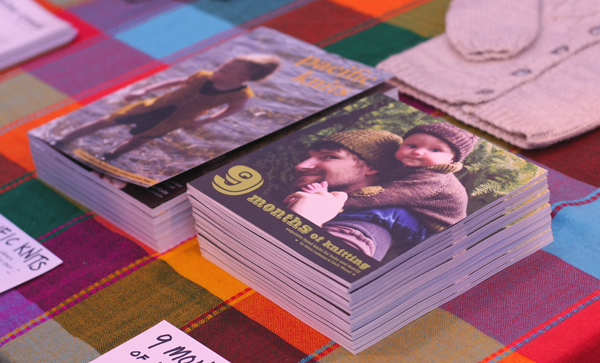 If you didn’t get your print copy at the Festival, order here. While most of our knitted samples reside in Vancouver, here in Edinburgh I have a lot of lace and a small sampling of garment samples; several from our upcoming lace collection Handmade in the UK. The UK based trunk show is gradually growing! The LOOT: impulse buying is important sometimes! One of the perks to working as a pattern designer is that dyers and yarn companies are usually happy to provide yarn support (free yarn to be used in published designs) because patterns sell yarn, so it is a good deal all around. Thus Alexa and I get to work in exotic and luxurious yarns by amazing hand-dyers. But requesting yarn support means planning ahead, making design proposals, and following through on designs… so it is not always the most satisfying method of yarn procurement! At the festival I allowed myself a generous yarn budget, left John to hold the fort, and zoomed around to impulse-buy some beautiful yarns, with blissfully little thought to project or design! 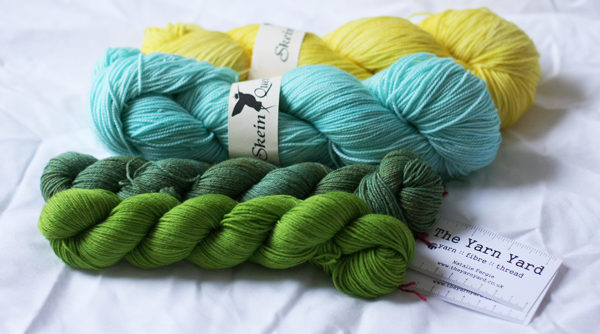 Loot: Skein Queen Entwist in lemon yellow and pale blue, The Yarn Yarn BFL and Merino Sock in 2 colours of green. Alexa will be at Fibres West next Friday or Saturday March 22-23. 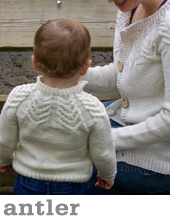 She has the lions share of our knitted samples, so stop by the booth to try on or fondle the Low Tide cardigan or the Antler Cardigan (in ladies & babies sizes), the North Shore and Snowflake pullovers, the Rosebud Shawl, and many more accessories. 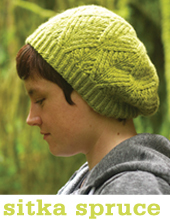 She will be signing books, selling single patterns, and she will have some of her beautiful hand-dyed yarn too! 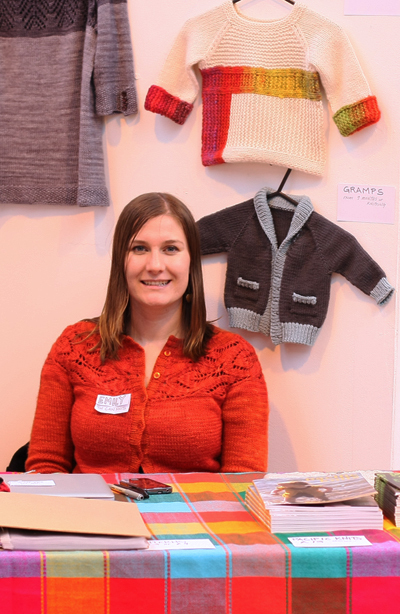 Emily will take the Tin Can Knits show on the road to Fibre East in Bedford on 27th and 28th July 2013. For more info on upcoming shows and other events, check our website. 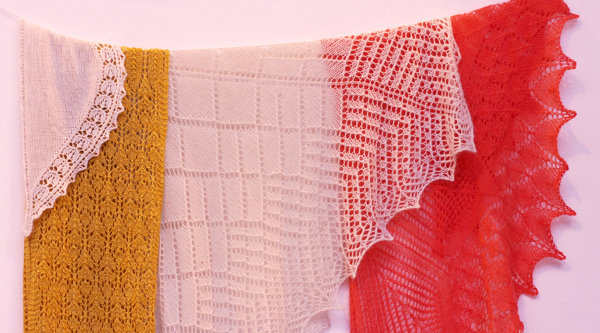 What will you knit next? 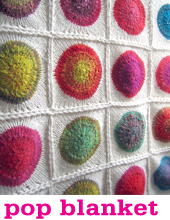 Join us for the Lush KAL on the Ravelry group, and be sure to sign up for our email updates if you don’t already receive them! Love your “Loot”, those are gorgeous. Yes, festivals are always fun, I enjoy going, and especially getting goodies to take home. Thanks for sharing with us! I really loved your stall! Such lovely designs and samples. I didn’t to chat with you Emily but I did chat with your husband – what a helper! Oh, and I did almost photo-bomb you but you were gracious enough to let me pass ;) Congrats on a successful market stall! Lovely to meet you there! It was lovely to meet you and thanks for signing my book, I am so sorry I thought your daughter was a boy, I am honestly not a ‘pink for girls, blue for boys’ sort of person!! Looking forward to knitting your patterns. Alexa doesn’t mind that her daughter Hunter is known, on the internet, as ‘the cutest boy ever’. Babies are androgynous!